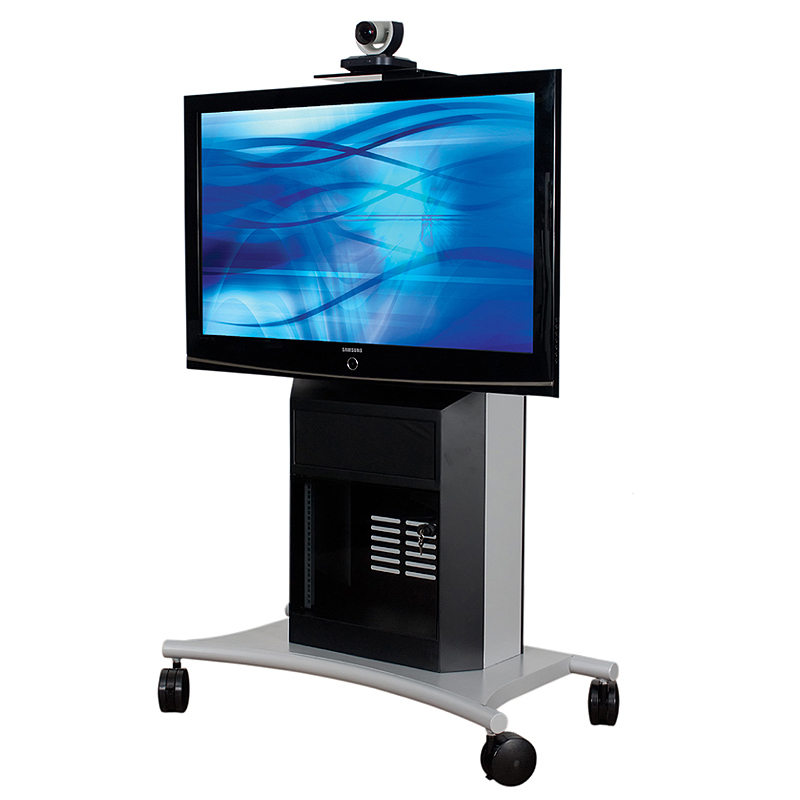 More on the AVTEQ Executive Series Media Cart for One 32-70 inch Screen RPS-1000S below. One standard 19" 8 RU rack mount bracket. Integrated PSM-200 M-Audio speaker module. Four 5" dual-track casters (2 with brake) for easy mobility on hard or carpeted flooring. Integrated, adjustable video-conferencing camera platform. Removable rear access panels for easy wiring and added ventilation. 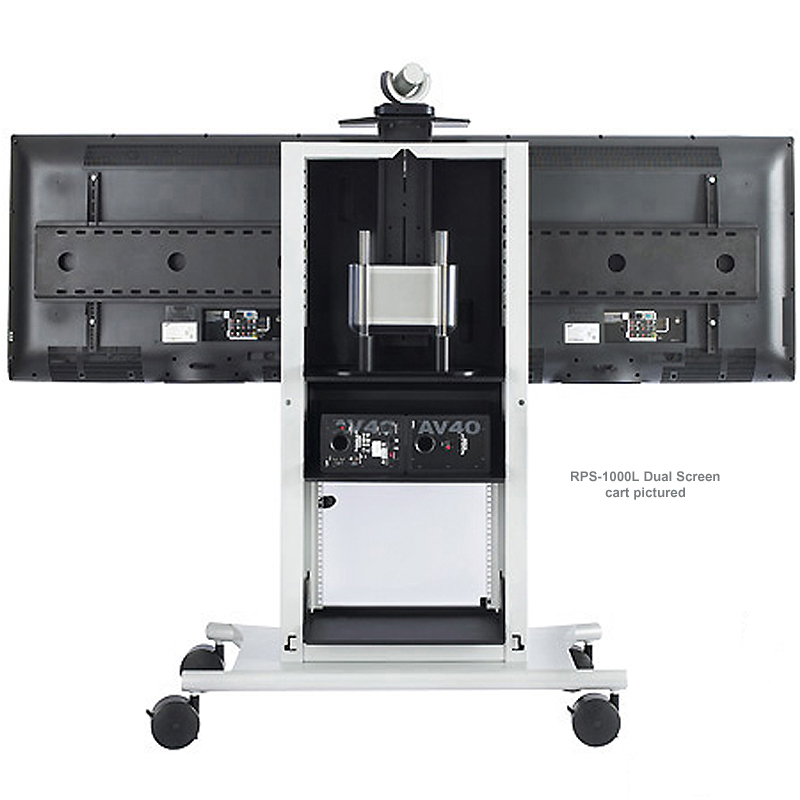 Integrated unviersal, locking, screen mount system, designed to accommodate almost any modern flat panel screen. One tempered, tinted, locking glass door for extra component security in public spaces. 100% solid steel construction with a durable, stylish, two-tone powdercoat finish. One 6-port APC surge protector. Optional extended back panel to increase the internal depth from 12 to 16" for mounting extra-deep equipment on the internal rack mount. One flat panel LCD, DLP, LED or plasma screen up to 70" and 300 pounds. PLEASE NOTE: Please enter the make and model number of your flat panel screen in the "Customer Notes" section of the check-out process. If you do not have this specific information, enter any information available (i.e. the manufacturer and screen size) or call our Sales Team for help. This will ensure that you receive the appropriate installation hardware for your particular screen.